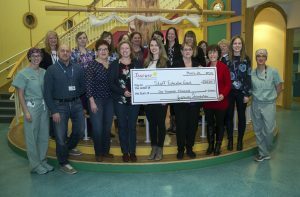 St. John’s, NL – The Janeway Foundation awarded $100,000 in grants to full time staff of the Children’s and Women’s Health Program and affiliated Eastern Health staff who work directly with the pediatric population to avail of education opportunities that will enhance their clinical practice. Grants approved enable staff to not only travel to conferences and training programs within Canada, but at times, to host conferences here in the province. Each year, the Foundation is proud to invest in continuing staff education, all to provide best care to our young patients. “Through donor generosity we are committed to help our staff serve the health care needs of children throughout the province by enabling them to continue with education in their area of expertise,” said Lynn Sparkes, President and CEO, Janeway Foundation. Pictured are just a few of the successful applicants for 2018-2019 staff education grants.